If you or anyone you love ever receives a “prayer rug” or prayer form in the mail from an organization known as St. Matthew’s Church, pitch it in the trash! I was alerted to this scam by a fellow parishioner at my parish who handed me some questionable materials she found in a friend’s bible. 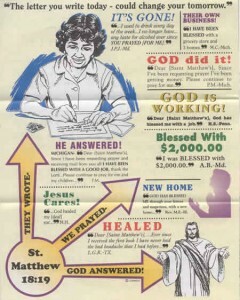 One was a prayer form that depicted a $500 and $1000 bill on one side with instructions to “pray over this miracle page, anointed with holy oil” for whatever amount of money they needed. On the reverse side was a FINANCIAL PRAYER FORM on which a person listed their financial needs. They were then instructed to “sleep on this page” along with another prayer page that night and return it with the guarantee that they would receive all they requested, plus a free gift. But it’s not nearly that simple. Apparently, once a person returns the prayer page, all hell breaks loose and they are bombarded with solicitations to send a “seed gift to God’s work” in order for their prayers to be answered. You might be thinking, “now who would send money to a place like this,” but you’d be surprised. So many people are sending them money, mostly vulnerable populations such as the low income or the elderly, that Dustin McDaniel, Arkansas Attorney General, went so far as to post a warning on his website about the organization. Apparently, his grandmother received a similar solicitation which was in the form of a “prayer rug” which consisted of a lavender colored sheet of paper with a picture of Jesus on it. She was instructed to take the prayer rug into a quiet room, kneel on it or place it over her knees, then pray with it for a length of time. She was then told to return the prayer rug within 24 hours so “others can use it and receive its blessings.” Once again, she was instructed to fill out the FINANCIAL PRAYER FORM. “The Attorney General’s Office has received scores of inquiries and complaints about the Saint Matthew’s solicitations,” McDaniel writes. “Consumers who provided Saint Matthew’s with their contact information have complained that after doing so, they were bombarded with solicitations and harassed constantly for donations. While some consumers could not get off the church’s mailing list, others complained that they did not receive their promised blessings even though they followed the letter’s instructions,” he writes. He claims that government agencies and charitable watch-dog groups have tracked Saint Matthew’s fundraising activities for several years. The Better Business Bureau’s Wise Giving Alliance reports that Saint Matthew’s has declined to respond to requests for information on how donations are used. It has also declined to provide the financial transparency prospective donors need in order to determine whether or not to give. I was able to discover that St. Matthew’s Churches, which was formerly known as St. Matthew Publishing, Inc., is a mail-based ministry that has a mailing address in Tulsa, Oklahoma and two churches in New York and Houston which are basically kept in order to maintain their tax exempt status. In 2007, they reported $6 million a month in revenue! Led by founder James Eugene “Gene” Ewing, a former tent minister who now lives in Beverly Hills, California in a $2.2 million home, he formerly wrote fundraising letters for the likes of Oral Roberts and Rex Humbard before starting his own Church by Mail Inc. This organization was involved in a decades-long struggle with the IRS before finally losing its tax exempt status in 1992. His “ministry” also has a long history of preying upon the low income and the elderly by using census records to target their mailings. Just as in the examples listed above, initial mailings only mention the “power of prayer” but once a person responds, they receive letters saying a monetary donation is required for their prayers to be answered. Trinity Foundation, an evangelical watchdog group that has investigated televangelists such as Benny Hinn and Kenneth Copeland, says the organization eventually opened two churches as a cover for their mail-based operation in order to retain their tax exempt status. I found the testimony of one man named Dan Calloway of The Chroniclers Web who says his name is still on the church’s mailing list after he returned a prayer form for a “free gift”. “Con artists in Tulsa, OK are literally using the name and image of Christ, and the Word of God to deceive individuals out of what money they may have by tricking them into sending them money as ‘seed’ for money they say will come many times over as a result of the Biblical verse from Galatians 6:7 (KJV) which states: ‘For whatsoever a man soweth, that shall he also reap’,” he writes. And, apparently, even if you don’t send them money, “you will never be able to get rid of them no matter how hard you try,” he writes, and says he’s still being bombarded with materials. Attorney General McDaniel cautions consumers to think twice before responding to this direct mailing campaign and others like it. “If the letter is not addressed to you specifically, contains no contact information other than a Post Office Box, and asks for money, I would advise consumers to throw it away immediately,” said McDaniel. Before giving to any church or charity, consumers can find out more about the particular organization through the Better Business Bureau’s Wise Giving Alliance Web site. Remember, it’s one thing to give alms as a sacrifice when we pray for our needs, such as when we light a candle along with a prayer, but God never makes the payment of money a condition upon which He will answer prayer! I have received letters for a couple years from St. Matthews Church. In the prayer request form, it is an option to send in money. Why is that so different than offerings that are taken up in church? The writer offers to pray for you and asks what your needs are. If anyone thought they were forced or coerced into sending money, obviously did not pay attention to the prayer page. Vervee – you’d be surprised how many people can be “guilted” into sending “seed money” in order to have their prayers answered. Others are truly desperate and strong emotions like this can really cloud one’s judgment. I think the history of this operation says it all – the lavish living, the IRS troubles, etc. I wouldn’t send them a bloody dime. I also have been receiving publications from St. Matthews for quite some time. I have been returning my prayer requests, but never any money. I do not wish to have any more dealings with them now that I have read the inquiries. I read your blogs. My heart wept for all of you, who have been victimized by Saint Matthew’s Churches scams. I am a Master’s Student working on two degrees and I was taken in by them. You know, the Bible says in the last days, even the very elect will be deceived. It wasn’t until I received a disturbing letter in the mail, on August 21, 2012, from Saint Matthew’s Churches, that I was compelled to investigated them online. I found that the Courts had ruled their entity to be a Fraud and a Scam! I was appalled at the prophetic word that they sent me. It stated, “Get your priorities straight and keep them there…,” translated, (‘get your house in order’)…You must understand that your stay here in this arena, the arena of life, is short, and that which comes is eternal, so I’m doing all in my power to reveal to you those things that really matter.” When I read their so called prophesy, it was then that I knew I had been hood-winked by false prophets, because, God sends his prophets to speak good into your life! Not death! The Bible says, ‘Death and life is in the power of my tongue…..’ Not some false prophet’s tongue! So I rebuked all that negativity in name of Jesus! I began to speak life to my life, and no weapons formed against me shall prosper! God said, ‘do not receive any bad report, only receive a good report!’ Therefore, I believe all that God has for me is good! Abundant spiritual growth, long life, good health and prosperity is what he desires for me! Now that Saint Matthew’s Churches have been exposed for the fraud that they really are, now I know that Ewing is not of God! That reminds me, God said, ‘even when psychics say things and they happen,’ we as Christians are still not to believe what they say. Only trust in God and believe the word of the Good Prophet, who was really been sent by God, and His Name Is Jesus! Continue to spend more time with Him and keep our minds on Him and He will direct our paths. In the beginning, when I donated to their Church, I thought it was a legitimate entity. Every time I received a letter from them, it seemed to come at just the right time. When somethings in my life were not just the way that I would have desired them to be, the letters came. I too, thought that it was God’s way of sending me a Word at just the right time; when I needed it the most. The letters were so comforting and encourage and uplifting. So, bloggers, be careful out there and for God’s Sake, be mindful of who you listen to. You know, now that I think of it, that’s the best example of a false prophet and a wolf in sheep clothing! I hope that millions get a chance to see our blogs and hopefully, our voices will shut down Ewing’s money-mill! God Bless and keep the faith!